Cooking at Café D: Who's Cooking Your Dinner? Image and Immigration. Let's hope the Disney folks don't get too cheesed off at my borrowing their photo. Not the meal - the movie. I love the idea that the food - and the pleasure that comes from eating it (and making it) is more important than any one critic's opinion. 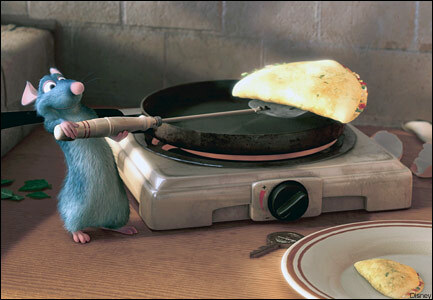 I loved many parts of Ratatouille - too many to mention. You know that Emeril is not back there slaving away in a 120 degree kitchen cooking your meal, right? Do you really think there is a French guy named Jacques in the back making your Crème Brûlée? Imagining your sushi shows the skill of Chef Suzuki? Are you of the mind that your buritto suizo is prepared by Pepé? I could attempt to wax poetic on the truth lurking behind those swinging doors. But, seriously. No one does it better than Bourdain. Bold and ballsy - Anthony Bourdain calls 'em as he sees 'em. And, the truth...well, I'll let Tony tell this tale. Here is a link to a Houston Press article which includes an interesting e-mail from Mr. Bourdain, delving into a culinary conundrum that involves image and immigration. It's in the December 19th blog post. I highly recommend reading Anthony's e-mail. It's good food for thought.